Vehicle safety has made huge process in recent years especially with the addition of advanced driver assist systems, but when it comes to crash protection, shockingly, a lot of improvement can still be made. 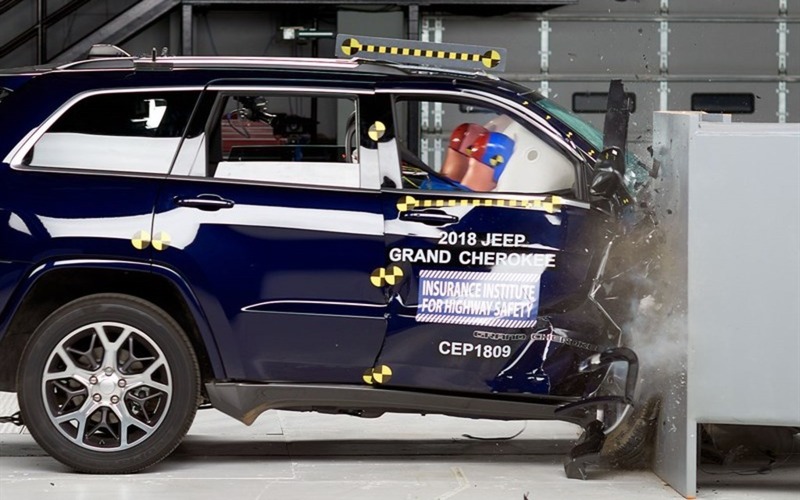 Take the U.S. Insurance Institute for Highway Safety’s (IIHS) latest passenger-side small overlap test on midsize SUVs for instance. While six of the eight models earned a “Good” or “Acceptable” rating, the popular Jeep Grand Cherokee and Ford Explorer both came away with a “Poor” result. A small overlap crash occurs when just the front corner of the vehicle strikes another vehicle or an object such as a tree or utility pole. The IIHS test is conducted at 40 mph (64 km/h) with 25 percent overlap between the front end of the vehicle and a barrier. In the Grand Cherokee, there was an intrusion of up to 10 inches at the lower door hinge pillar. Also, the passenger dummy's head hit the dashboard hard through the front airbag and then, because the side curtain airbag didn’t deploy and the door opened, it moved outside the vehicle during rebound. In fact, data from the dummy indicates that right leg injuries would be likely in a crash of this severity and a head injury would be possible. The Explorer fared even worse with an intrusion of 15 inches at the lower door hinge pillar and 13 inches at the upper door hinge pillar and the dashboard. What’s more, the door sill was pushed in six inches toward the dummy. According to the IIHS, there would be a high likelihood of injuries to the right hip in a real-world collision of the same severity, as well as a possibility of left lower leg injuries. “In those SUVs, the airbags, safety belts and structure showed serious deficiencies,” says IIHS Chief Research Officer David Zuby. “A front-seat passenger would be at risk of injuries to the head, hip or leg in a right-side small overlap front crash." Ford is currently working on a redesign of the Explorer, due for 2020, and promises the new generation will have improved small overlap protection for both the driver and front passenger. “Customer safety continues to be one of our highest priorities when we design any of our vehicles and we continually make improvements to our vehicles to help our customers stay safe on the road," Ford said in a statement. "Explorer is a safe vehicle and has earned the highest 5-star overall NCAP ratings in the U.S. as well as 'good' ratings in front and side IIHS crash test modes." The other vehicles in this test included the GMC Acadia, Kia Sorento and Volkswagen Atlas, which earned a “Good” overall rating, as well as the Honda Pilot, Toyota Highlander and Nissan Pathfinder, which were rated as “Acceptable.” Incidentally, the updated 2019 Sorento is the only one to receive the IIHS’ highest award, TOP SAFETY PICK+.